Lightly spray bottom and side of 3 1/2- to 4-quart slow cooker with cooking spray. In 10-inch nonstick skillet, melt butter over medium-high heat. 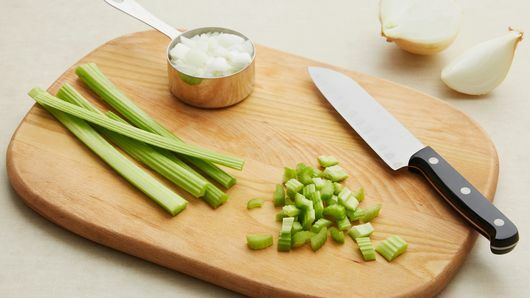 Add celery and onion; cook 3 to 4 minutes, stirring occasionally, until crisp-tender. Place bread cubes, celery mixture and broth in slow cooker; toss to combine. Cover; cook on Low heat setting 3 to 3 1/2 hours. Stir before serving. For a more moist stuffing, stir in 2 to 3 tablespoons chicken broth after cooking. 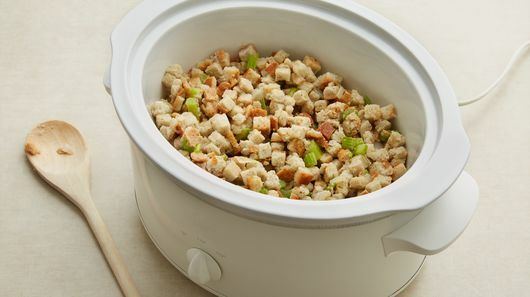 If your family doesn’t like stuffing cooked in the bird, but you just don’t have enough real estate for yet another casserole dish in the oven on Thanksgiving, turn to this simple crockpot stuffing to save the day. It only requires five ingredients and the slow cooker does all of the heavy lifting for you—this dish cooks on low heat for three to three and a half hours while you continue to prep the big Thanksgiving dinner. All you need to do is give it a stir right before serving! This stuffing is delicious in its simplicity, but feel free to mix in extra ingredients like cranberries, cooked sausage or extra herbs like sage or thyme. 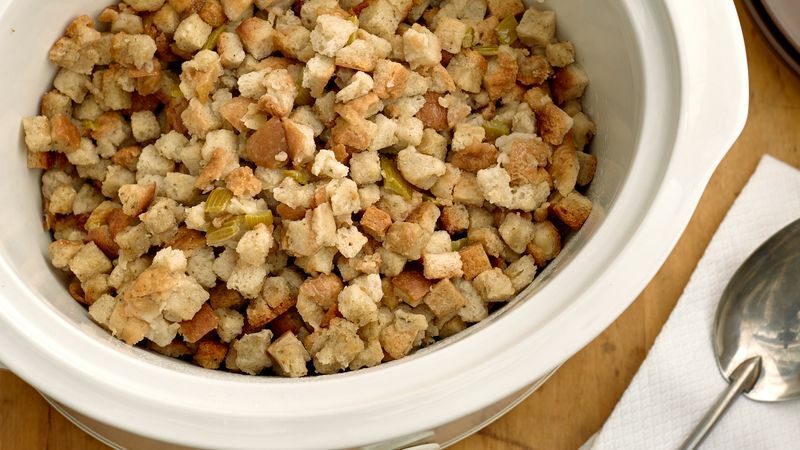 If you need more stuffing inspiration, check out all of our best recipes for Thanksgiving stuffing. Have multiple slow cookers on hand? Stuffing isn’t the only side you can make in the slow cooker. We have recipes for green bean casserole, mashed potatoesand even sweet potato casserole with marshmallows.